This is a FREE event. Sponsored and volunteer supported - THANK YOU Brainerd Rotary Club! Thank you Sullivan Candy & Supply for your large candy donation! 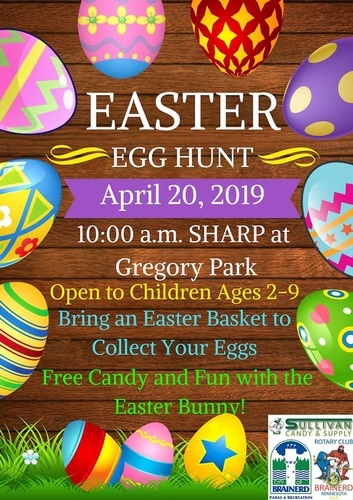 The Brainerd Easter Egg Hunt will take place on April 20, 2019. 10:00 a.m. sharp. Be at the center circle in Gregory Park by 9:45 a.m. no later! The event usually takes less than 15 minutes. If you arrive later we cannot promise there will be any eggs to pick up. Plan accordingly there is a small parking lot but most parking will be street parking. The Easter Bunny will be there for hugs and pictures! Please bring your own bag or basket to collect eggs! There will be 4 different age group egg hunt "quadrants"
The quadrants will be explained and labeled when you arrive. We will all meet and listen to directions in center circle before heading toward quadrants. Each child will be advised to select a color. Once they collect 10 eggs in that color they are able to turn the eggs in for a goodie bag. If there are still eggs to be found they are allowed to go back into their quadrant and search.